Crestor (Rosuvastatin) is a prescription-only drug given to patients suffering from high cholesterol, who are therefore at risk of a stroke or heart attack later in life. Crestor reduces the ‘bad’ cholesterol in the blood (LDL-C) and increases the ‘good’ cholesterol (HDL-C). Part of a group of medicines called statins, it reduces the amount of fatty substances, known as lipids, made by the liver. Crestor blocks the action of the enzyme in the liver that produces cholesterol; with less cholesterol in the liver, the body takes it from the blood, reducing the build-up of fatty deposits in the walls of the blood vessels. This prevents the narrowing of the blood vessels, lessening the risk of life-threatening blockages. There is evidence that Crestor also lowers the levels of hs-C Reactive Protein, which has also been linked to heart attacks and strokes. 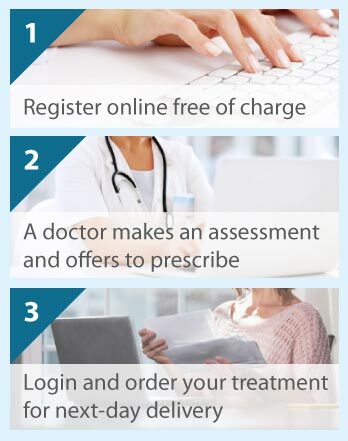 Crestor is a prescription medicine so you will need an online consultation before you can buy Crestor online. Consultations are entirely free and you will be under no obligation to make a purchase. You will need to visit your own doctor for a blood test to establish your cholesterol levels and levels of C Reactive Protein. Only after we have that information can we establish whether it is advisable for you to take this medication. We cannot publish any price list for Crestor or any other prescription medication prior to a consultation. This policy accords with MHRA advice and its interpretation of existing statute. A full price list is available for all medications that are appropriate for the condition for which you register immediately on approval by one of our doctors. Is it the right drug for me? If you have tried to reduce your cholesterol through healthy eating and taking exercise but still have above-average cholesterol, then Crestor may help you. However, it is not recommended if you have liver or kidney problems or have a family history of such problems, or are suffering from, muscle problems (for example, repeated muscle ache). It is also not suitable for pregnant or breast-feeding mothers and those taking certain other medications. It is important that you make a full disclosure to our doctors so that a correct assessment can be made. Crestor can also help patients with elevated levels of C Reactive Protein. As with any medicine, some people experience side effects when taking Crestor, though these are usually mild and disappear after a short period. These can include headache, muscle pain dizziness, constipation, nausea, and feeling weak. A full list of potential side effects is provided with the pre-purchase guidance that is provided should you be approved to take Crestor. If you wish to find out more, please feel free to contact us or speak to your GP. If you are currently taking another statin then we do not recommend that you change your medication. You should only change any existing medication in consultation with your own doctor.